This classic sherpa-lined buffalo plaid hooded flannel shirt is perfect for those cold days when you need something warm to wear, but don't want the bulk of a winter coat. Excellent jacket for working in the yard or garage, walking the dog, or just hanging out! Features include full front zipper, polyester lined sleeves for on-off ease, full sherpa lined body and hood for warmth, plus two lower hand-warmer pockets! Ordered this for my son and it just came today. He put it on right away and proclaimed it to be "epic"!!! The body and hood are sherpa lined but the sleeves are not. Lined sleeves would have earned 5 stars! They are actually lined with some kind of polyester material and feel a little quilted or something, so the sleeves are not totally unlined, just not sherpa lined. Other than that, it does look great. The colors are vivid, the zipper works well, and it's a pretty good weight. Glad we found this here in a S, couldn't find it anywhere else. Color red is bright, not dull as on some. Sherpa goes through to hood to keep ears warm. The fit is loose for heavy sweaters and sweatshirts. Zip up front avoids button gaping where cold seeps in, as well as buttons getting caught on this. Two warm side pockets as extra. Fits great and is sewn well. Score! I really can't rate this product very well as it had to be returned because it was to small for my husband. I asked to have the product exchanged for a larger jacket but instead my money was returned to me. I wasn't to happy about this because my husband really needed this jacket and so far I have not found one at the price this was when I originally purchased it. Also one of the side pockets was sewn shut so there was an issue with quality control from the manufacturer.. This jacket was perfect until it came to zip it up because the zipper in on the wrong side according to my husband. He said it's a woman's jacket because of the zipper being on the wrong side but he still like it. I got this for my son. He works in an open building,he loves it. Says it keeps him warm. Bought for my brother's birthday gift and he loves it so much! Nice fabric, but size is smaller than expected. My husband had one in the past that wore out. This is exactly what he wanted! 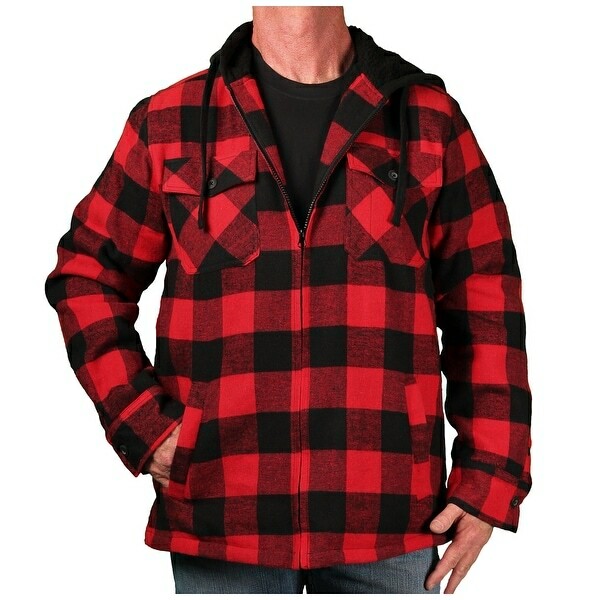 "does the Burnside Men's Sherpa-Lined Hooded Buffalo Plaid Zip-Front Flannel - red buffalo plaid - Large, run small?"